Springfield Mayor Domenic Sarno's endorsement of Republican Gov. Charlie Baker in the 2018 election is one reason the Democratic mayor has been told he will not be invited to speak at the Democratic convention in Springfield in September. Springfield will host the Massachusetts Democratic Party’s issues convention in September. The city’s mayor, who is a Democrat, will not be participating. When Democratic Party activists convene in Springfield on September 14 they will not hear a customary welcome address from the mayor. The state party committee voted to not invite Mayor Domenic Sarno to speak at the convention. "You know, maybe they don't want to hear what I have to say," said Sarno. Sarno may be a lifelong Democrat, but his current relationship with the party is estranged, in part, because of his support for Republican Gov. Charlie Baker in the 2018 election. Sarno was one of about two dozen Democratic mayors who endorsed Baker for a second term, and he appeared in a TV ad for the governor’s reelection campaign. "I guess they based in on my endorsement of Gov. 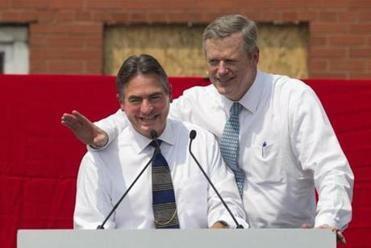 Charlie Baker who has been very good to me and the city of Springfield," said Sarno. " Bipartisan is what I am. Bipartisan. This is what we need more of in government." When he heard he would not be invited to speak at the convention, Sarno sent a handwritten note (scanned and emailed) to Gus Bickford, chairman of the Massachusetts Democratic Party, offering his administration’s help to put on a successful event. "It will be a great economic development spin off for my city, our city, so whatever I can do to help them out we will go from there. It's fine," said Sarno. In an interview, Sarno said he has no hard feelings about being shunned at the convention.
" No. People know who I am and what I am about. I say what I mean and mean what I say," said Sarno. According to Politico, which was the first to report on Sarno’s snub, another factor is his stand on immigration issues. Last year, Sarno ordered a city inspection of the South Congregational Church after it took in an undocumented immigrant who was facing deportation. He fought the City Council for months over an ordinance that he said would turn Springfield into a “sanctuary city.” The Welcoming Community Trust ordinance was enacted in January over Sarno’s veto. The move to exclude Sarno from participating in the convention was more than just payback for the Baker endorsement, according to Matt Szafranski, Editor-in-Chief of Western Mass Politics & Insight. "From people I have heard from who were at the most recent state committee meeting the issue with the Welcoming Communities ordinance and the South Congregational Church came up at the meeting," said Szafranski. " I think it was on the minds of a lot of people." Also, Szafranski said Sarno is not active in local Democratic party circles, and has not developed relationships with many Democratic office-holders outside of western Massachusetts.
" The Democrats, despite Charlie Baker, are still dominant in this state and (Sarno) does not seem to be making much of an effort to maintain those relationships if they extend beyond the city of Springfield," said Szafranski. Sarno, who is beginning his 12th year as mayor of the state’s third-largest city, has already said he will run this year for reelection for another 4-year term. Municipal elections in Massachusetts are non-partisan. The mayor of Springfield, Massachusetts is threatening the tax-exempt status of a church because an undocumented immigrant is being sheltered there. As a municipal election year begins in January, the mayor of the largest city in western Massachusetts and the city’s legislative body are clashing. One of the disputes could wind up in court. The largest city in western Massachusetts is beginning the new year with a new effort to hire a more diverse municipal workforce. Massachusetts voters Tuesday handed decisive re-election victories to incumbents running statewide, regardless of party affiliation.